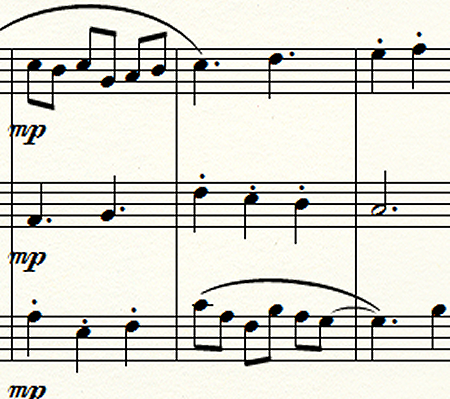 This is a string trio (no continuo) generally in the Baroque style. This started as a school exercise many years ago, but I later decided, on a whim, to turn it into three movements. It is still short. All three 'movements' are together about the size of a single one in period. Purists will complain that this is not really pure Baroque—particularly the new movements—and they will be right. I reserve the right to remain a 21st century composer, even when the pieces are, uh, derivative. It is Derivatives I, simply because I might do something else in this vein. The 'performance' comes from Finale® using Garritan® strings.